It’s important to know specific information about an industrial compressor prior to purchasing the one that is the best fit for you. Be sure to know what goes along in correlation with CFM ratings, because only reciprocating compressors are piston-type compressors. It is all about positive displacement workings, as far as air is produced, but they should go up to certain CFM rating and a certain horsepower rating. If a customer is a small tire shop looking for a new compressor for their system, a reciprocating compressor will work for them because it has a smaller horsepower and less air use. If they are looking to upgrade, it is best to go from a reciprocating to a rotary vane compressor, just because it is still in the lower horsepower range. The particular brand that we carry, the higher vane, only goes up to a 60 horsepower range. We have to be careful with it, because if they are only using it sporadically as opposed to being used full time, then we have to look at different types of compressors that like to run full bore. Other things that need to be considered are the environment, what type of a conditions are present, , whether it is a dirty process or it is a clean process, how easy it is going to be to maintain these compressors, what kind of ventilation we have, and the power sources (a lot of compressors are rated at certain volts such as 200 volts to 08 volts or 230 volts, or 460, 575). Each sort of rating needs to be considered when thinking about the environment in which the pump will be located. C and B Equipment can assist you in figuring out which kind of compressor to purchase! There are a lot of other variables such as ambient temperatures. We have to make sure that wherever these industrial compressors are going to be located that it is not more than 200 degrees F. If it is, then modifications will need to be made to the facility for these compressors to be able to operate. 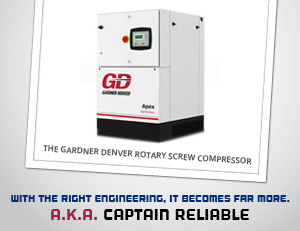 Maintenance schedules are also important when it comes to deciding on your compressor. Some companies don’t maintain their compressors, and we have the ability to do that for them, but a lot of places opt to do it themselves. We also have to make sure that if we put a certain type of compressor in a facility that it will work in the environment, that it is the proper compressor for that type of facility, and that it will be well-maintained. Otherwise, it doesn’t matter whether the compressors are Gardner Denver or an Ingersoll Rand, Sullair, Atlas Copco, Kaeser, Quincy; they all have to be maintained regardless of where you put them, in order for them to have any kind of longevity.